Photoplay was the leading Hollywood fan magazine of the 1920s and 1930s. Like today’s celebrity magazines, Photoplay offered insight into the lives of popular movie stars and their work, though perhaps with more substance. The magazine was also an important advocate for amateur film and the first organization to hold a major amateur movie contest (Tepperman, 54). Our database includes films and filmmakers from Photoplay’s $2,000 Amateur Movie Contest which was organized for two consecutive years from 1928-1929. Ad for Photoplay’s Amateur Movie Column, Photoplay, February 1927, 28. Beginning in March 1927, a monthly column devoted to amateur filmmaking written by Photoplay’s managing editor, Frederick James Smith, was included in each issue of the magazine. Early writing in the column focused on amateur filmmaking technologies, creative advice, and techniques. It later shifted focus to the filmmakers themselves, and the amateur film culture that came with the increasing number of amateur movie clubs springing up in cities across the United States. The Amateur Cinema League worked with Photoplay to offer news on club activities as well as organize the two amateur contests. 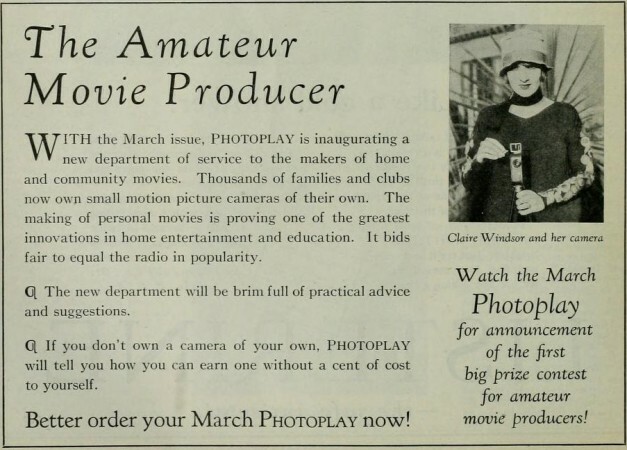 In 1928, Photoplay held the first major amateur movie contest with $2,000 in cash prizes for the winning films. That year, judges included the president and founder of the ACL Hiram Percy Maxim; Samuel “Roxy” Rothapfel, managing director for the Roxy theatre; and photographer Nickolas Muray, who later became known for his relationship with Frida Kahlo. To be considered for the contest, the films entered could be any type of genre, but were required to be either 35mm, 16mm or 9mm, with prescribed lengths for each. Anyone could submit films, except professionals and those working for Photoplay or relatives of Photoplay employees. One prize winner was chosen for each of the three gauge categories with a fourth “Special Award” division for next best film in any gauge. The first prize was awarded to Russell T. Ervin and The Motion Picture Club of the Oranges, New Jersey for “And How!” a short comedy about a restless young husband. The other winners were B.V. Covert’s study of a quail hunt; Clarence R. Underwood’s 9mm film of the St. Louis Zoo and Canadian Kennin Hamilton’s adaptation of Thomas Hood’s “The Dream of Eugene Aram”. 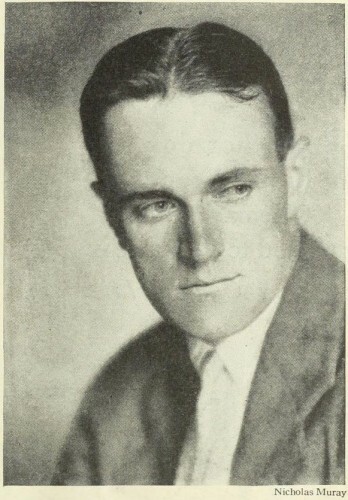 Photo of Russell T. Ervin in Photoplay, Sept. 1928, 69. Prize winning films of 1928 were screened at least once in New York City, and at private viewings, one of which led to the hiring of Russell T. Ervin, 35mm prize winner, by the William Fox Company (Smith, 68). The magazine proudly stated that they were the first amateur film competition ever held, and that analyzing contest entries encouraged the development of high amateur aesthetic standards (Smith 67). Its effort to characterize the contest as dignified points to a concern that magazine-sponsored contests were generally seen as frivolous or silly (Tepperman 56). Photoplay believed their contest was exceptional and worthwhile, with editor James Quirk positing that the Amateur Movie Contest might be the most important and far-reaching achievement ever accomplished by the magazine (28). After the success of Ervin, Photoplay marketed the next contest as a bridge between the amateur experimenter and the professional filmmaker in the studio. The magazine announced that winning films of the second contest would be shown to motion picture executives in both Los Angeles and New York advising that there has “never been a more practical way to get a chance in motion pictures” (Smith, 69). In addition to the opportunity to be discovered by Hollywood, Photoplay also emphasized the opportunity to expand film art through experimentation (Tepperman 55). Furthermore, Photoplay’s Quirk argued that the amateur movement was a “healthy aid” to professionals and that amateurs were not a menace to Hollywood like cheap vaudeville was (28). Experimentation in the medium was impossible in commercial Hollywood and amateur filmmakers had an opportunity for creativity and play outside of the industry. The 1929 contest format was altered to rules that the magazine believed to be more fair. Films were divided into two separate classes, with winning movies receiving anywhere from $100 to $500. Class One films were fiction films, while Class Two encompassed all other films. The judges for 1929 included Hollywood director King Vidor; secretary of the national board of review, Wilson Barrett; Photoplay editor and publisher, James Quirk; and two ACL representatives, Stephen Voorhees and Roy Winton. Winning films emphasized the unconventional qualities of entries and were announced in the November 1929 issue of the magazine (Tepperman 56). 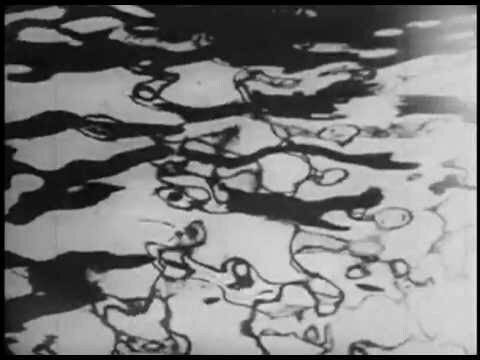 The $500 prize winner in the dramatic photoplay category was “Three Episodes,” a 16mm film about what goes through the mind of a dying soldier, while the nondramatic category Class Two winner was Ralph Steiner’s “H2O,” an abstract film about water. Among the prize winners was Hiram Percy Maxim, who opted to compete instead of judge the contest that year. He won third place in the nondramatic category with his scenic film Summer. Photoplay’s amateur film department disappeared after the November 1929 announcement of the winning films, probably ceding all amateur movie coverage to the ACL. Quite likely, the ACL used the experience of the two Photoplay contests when it launched the first annual Ten Best contest in 1930 (Tepperman 57). “Photoplay’s $2,000 Amateur Movie Contest”; Photoplay, May 1927: 48. Smith, Frederick James, “Amateur Movies”; Photoplay, Jan. 1928: 67. Quirk, James R., “Close-Ups and Long-Shots”; Photoplay, June 1928: 27-28. Smith, Frederick James, “New Amateur Movie Contest”; Photoplay, Sept. 1928: 68-69.